The modern era has forgotten how huge the western genre was. In the 1950s television was as thick with western programs as it was with sitcoms in the 1980s, with cop shows in the 1970s and with utter crap now. Comic books reflected this craze. Westerns sold well in the 1950s into the 1960s. Marvel and DC each had several titles still running into the 1970s. The comic Weird Western Tales was a direct descendant to the golden age’s All Star Comics starring the Justice Society of America! All Star changed its name to All Star Western in May 1951 and continued the original numbering with #58 going to #119 in July 1961. All-Star Western (with a hyphen) was revived with issue #1 in September 1970. It ran for 11 issued until it changed its title (and format) to Weird Western Tales with #12 (July 1972). Jonah Hex debuted in #10 and continued as the star of the series until #38 (February 1977) when he was spun off into his own series. The comic then featured Scalphunter until the series was cancelled with #70 (August 1980). The change in title and format was due to the success of Weird War Tales, another DC comic that combined two (obvious) genres. 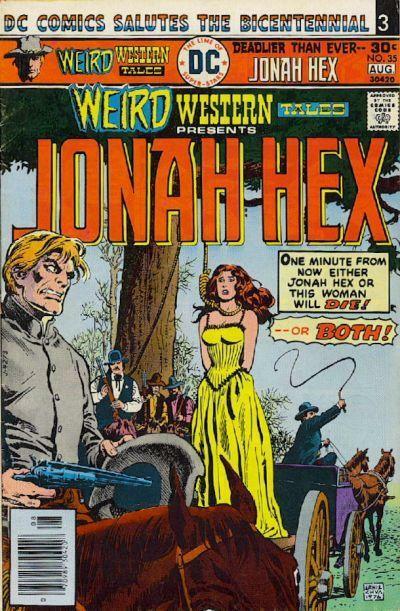 Jonah Hex was introduced in the still-called All-Star Western #10. As a child he was sold into slavery to an Apache tribe, but was made a full tribe member when he saved the chief. He was left for dead while fighting the chief’s son over a woman. As an adult, he joined the US Army during the Civil War, eventually shifting loyalties and joining the Confederate Army. He turned himself in after Lee’s surrender. (From Wikipedia): Jonah then locates his old tribe and tells the chief how the chief’s son, Noh-Tante betrayed Jonah years before. The chief decrees that this must be settled by a tomahawk battle. Noh-Tante secretly sabotages Jonah’s tomahawk so that the handle will break. In an act of desperation during the fight, Jonah pulls a knife and kills Noh-Tante. As punishment for breaking the rules, Jonah is bound and the chief presses a heated tomahawk to the right side of Jonah’s face giving him “The Mark of the Demon.” The tribe banishes Jonah. Jonah then became a bounty hunter, with a reputation as the most fierce and deadly gunslinger in the west. The character was thrust into a post-apocalyptic future in the 1980s. He was revived in the 2000s as a successful western comic. A Jonah Hex series (in a thrice-revived All-Star Western) was introduced in 2011 as part of DC’s “New 52” line for 34 issues. Hex is ambushed by the Yellow Mask Gang and left for dead in the Arizona desert to die. He is rescued by “Red Eye” Charlie. Hex accompanies Red Eye to the town of Hall Valley. When they arrive, Hall Valley is having a town fair – highlighted by the hanging! The woman to be hung took $10.00 from a drunken cowboy. The Marshall of the town certainly keeps stern law and order, it seems. Red Eye is later arrested for public drunkenness. The Yellow Mask Gang robs the Hall Valley bank. Hex captures one member (Bill) and goes into the countryside after the rest. We find out the Marshall is in cahoots with the Yellow Mask Gang, but shoots the captured gang member before he reveals all. Red Eye overhears Marshall’s conversation with Bill and witnesses the shooting from his cell. To shut him up, the Marshall plants evidence that Red Eye is a member of the Yellow Mask Gang and sentences him to hang (the Marshall is also the justice of the peace in these parts, ya see…). Hex dispatches the Gang and returns with some live prisoners and asks for the reward. He returns just in time to save Red Eye from the gallows and Red Eye reveals the Marshall’s shooting of Bill. Bill’s brother, Jed, is shocked and angry at his brother’s death and tells everyone the truth about the Marshall! The Marshall is hanged as the festivities continue. Popcorn! Hot fudge! Cold Beer! Hex is offered the job of marshal for good, steady pay as long as he keeps up the hangings every few weeks like the old marshal did. Good for morale, good for business, ya know. Hex rides away in disgust. Trail Talk (letter page): comments for WWT #32 – Mark Schmeider, Concord, Mass (positive), Matthew Elyosin, Madison, CT (negative) and John Elliot, New York, NY (positive).